Where is the Juno Spacecraft right now? 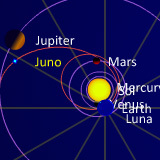 The app above shows the trajectory of the Juno Spacecraft and where it is right now. You can also wind the animation backwards in time to watch its launch and its flyby of the Earth before entering Jupiter Orbit in 2016, and crashing into Jupiter at the end of its mission in July 2021. The original version of this image and other versions available here. This interesting seminar shows us the first results from Juno's mission. The main section of the video is the first 40 minutes and covers imagery of the planet, the composition of the atmosphere and the magnetic field. After that it's questions and answers. Juno was launched on the 5th of August, 2011, and entered into orbit about Jupiter on July 4th 2016 and wias planned to study the planet until February 2018 when it was to de-orbited and crashed into Jupiter. However an extention to the mission means the spacecraft will survive until July 2021. Explore and study Jupiter's magnetosphere near the planet's poles, especially the auroras – Jupiter's northern and southern lights – providing new insights about how the planet's enormous magnetic force field affects its atmosphere. 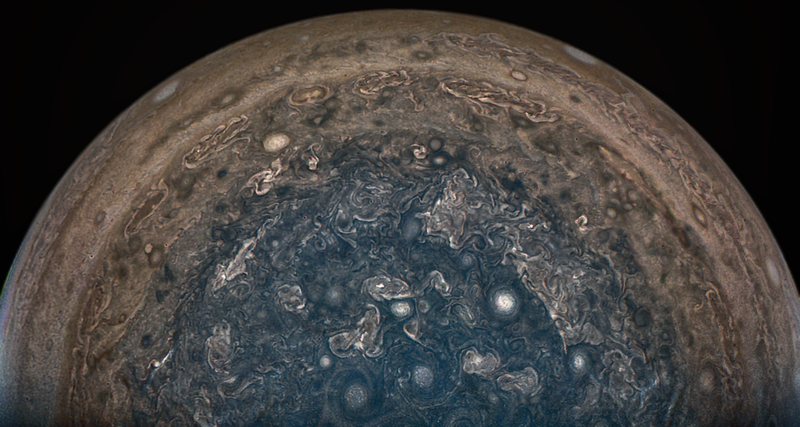 What's so special about Juno? 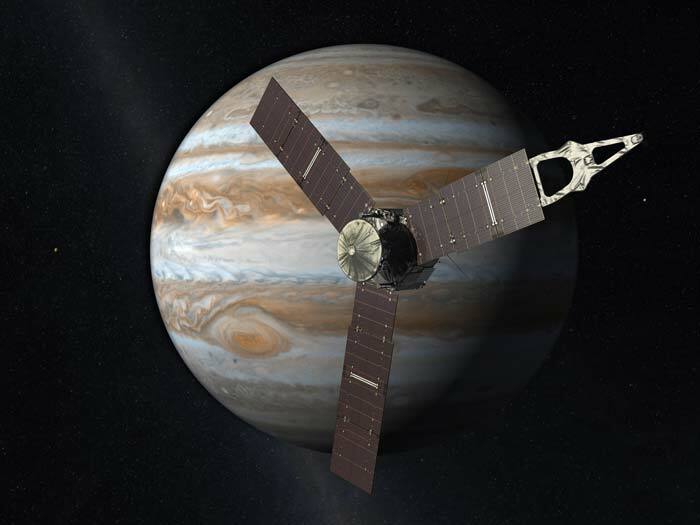 Juno is only the second proble to orbit Jupiter (Galileo being the first) and gets in much closer to Jupiter. 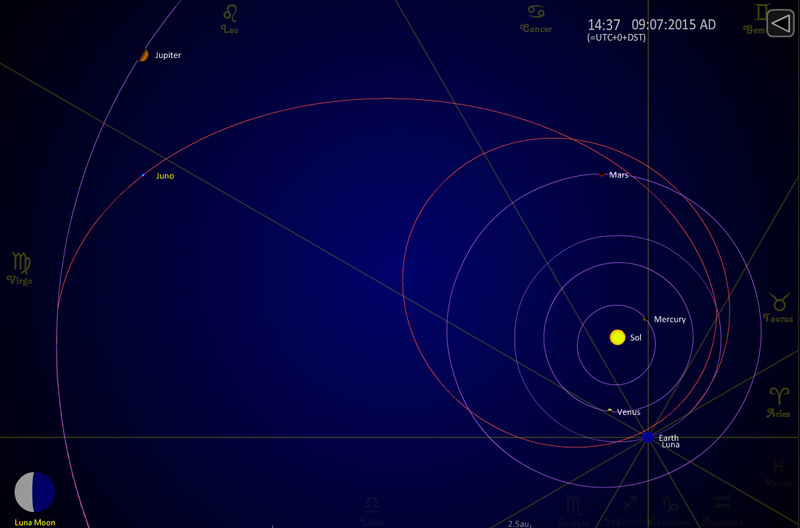 Its 14 day (origjnally - now 53 day) polar orbit is highly elliptical with the probe passing very close to the planet at its nearest approach, and skimming only 4300km above the planets cloud surface. 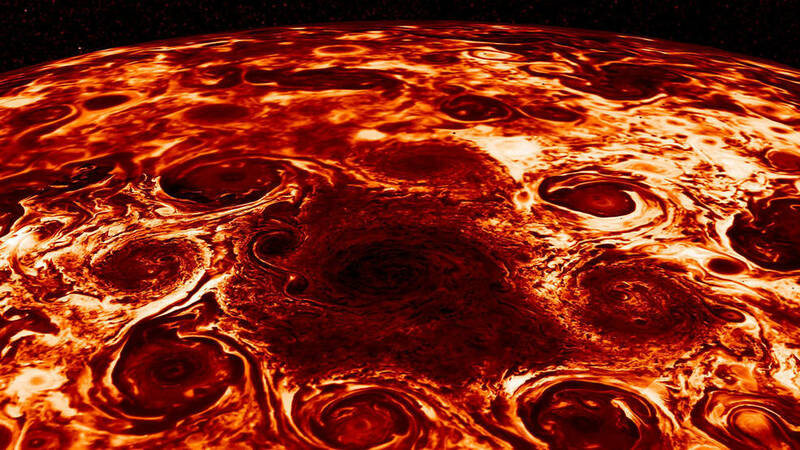 This means that it passes through Jupiter’s intense magnetosphere which has radiation levels that would fry most electronics (or people if they could get there) very quickly. Juno's sensitive electronics are armoured within 1 cm thick titanium walls which will help to reduce the radiation significantly. It only has to endure the radiation at closest approach (some 2-3 hours at a go) but will spend most of its orbit further out in a more benign environment. However some of its sensors are not expected to last the entire 37 orbit mission. October 19, 2016 Perijove 2: Planned Period Reduction Maneuver, but the main engine's fuel pressurisation system did not operate as expected. 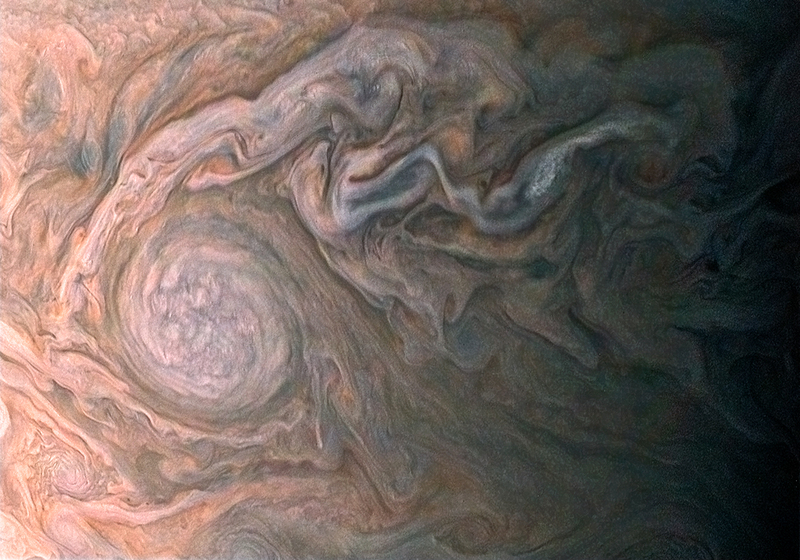 July 16, 2018 Perijove 14, end of primary mission. July 30, 2021 Perijove 35, end of extended mission.